America has a long tradition of letting large numbers of foreign students enrich universities. The quality and success of the research this has led to supports the idea that diversity is good for creativity. It has long been an ambition in the European Union to stimulate movement of students between the member states and now this circulation of talent seems to gain momentum. For instance, the spring term application process to Swedish universities is now finished and there are more foreign students than ever – just above ten percent. Earlier I have reported examples of what Swedish and Hungarian universities do to attract foreign students but the record figures mentioned above is mostly a result of the Bologna Process. It started in July this year and is a standardization of European university degrees. The aim is more interaction, more international atmosphere and more exchange of experiences. Hopefully the long-term effect of mixed perspectives will be a development that is similar to the successful American model. Bangalore-based designer Mohan Rao is working on a project for restoration of the water reservoirs around the historical town of Hampi in India. His small and interdisciplinary firm Integrated Design provides alternative methods for sustainable hydrology – a vital part of the global sustainability movement. Since big hydrological dams cause a lot of ecological and social problems Rao prefers small-scale solutions and in the Hampi case he found he could build on historical experiences. 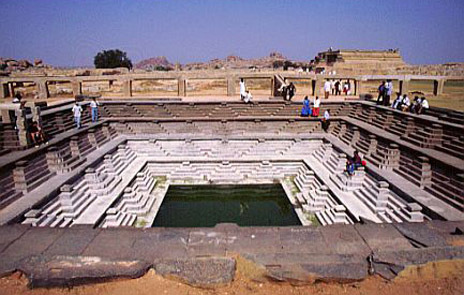 When he took part of the archaeological surveys of Hampi he became very interested in how the old empire of the Vijayanagars (1336-1646 AD) solved the water supply problem since the landscape is very dry. Soon they worked hard to understand an old and very advanced system consisting of percolation pits, detention ponds, wells and pipes. Then they integrated this awareness into their design since an advantage of the ancient system was that it didn’t consume any energy. It is not strange that Rao found a solution by combining ancient and new methods at the intersection of archaeology and modern engineering. It is natural for him to cross the lines between fields. He became disillusioned by conventional design since there are usually strict barriers between architecture, landscape, engineering and site management. According to Rao it is better to combine all those perspectives when solving problems - that is why he started Integrated Design in the first place. Read an interview with Mohan Rao for more details on the Hampi project. Tolkien in his turn created his groundbreaking trilogy by intersecting ancient mythology with the modern novel. Considering the impact it has had it is strange that is was not done earlier. It is also interesting that this innovative vision belonged to an extremely conservative scholar like Tolkien. Maybe the more experimental authors of the early twentieth century (and they were many) would not see the possibility of mixing experimental narration with archaic language; maybe visionary but old fashioned Tolkien was standing at an intersection nobody else could see? Anyway, if we look at the development of western literature as a whole we will see that all the important leaps were taken at intersections between cultures, genres or ways of expression. The idea of putting stories in writing in the first place is usually seen as the invention of a rhapsod (storyteller) we know as Homer. 2700 years ago he intersected the Greek oral storytelling tradition with a concept that was quite new at the time – the alphabet. Three months ago I wrote post about a survey that showed that women board members reduce the risk of bankruptcy in Swedish companies. More recent statistics show that female entrepreneurs gain more and more influence in the country; they start more companies, they get higher positions and they control more money. Globally women have become more active both as producers and consumers and in Sweden this change appears to be very rapid right now. Four out of ten women aim at some kind of managerial position and it is not just words - more women than men choose to get a university degree and they also get better grades. As I have mentioned before the one aspect of diversity that gets the most attention in this country is gender and now that women are taking a step into the creative part of the economy you can read about it every day. Sometimes increased creativity is mentioned but it is never explained or seen as an important aspect of this paradigm shift. Hopefully we will see this diversity generate innovation soon. Clearly there is a lot to gain at the intersection of biology and engineering. Earlier I have written about a skyscraper inspired by a flower and an express train modelled after a shark. Now nature is being imitated in the development of the next generation of microchips. IBM researcher Dan Edelstein has headed a project where vacuum is used as insulation between copper wires in semiconductors. The advantages are improved performance and decreased energy consumption and the chip is now being tested. It is not expected to be in our computers until 2009 but Edelstein believes that other insulating techniques will be abandoned in the future. The manufacturing process, however, was an obstacle. Inserting the minuscule vacuum gaps between the wires is very difficult - and this is where nature comes in. While working with the project Edelstein read papers on self-assembling molecules published by Chuck Black, another IBM researcher. It was a different field but he saw the possibility it provided. This was the input they needed to come up with a manufacturing method: The chips are put together with a technique that is a synthetic imitation of how seashells, dental enamel or snowflakes grow molecule by molecule. The idea of vacuum insulation combined with the concept of self-assembling molecules is an excellent example of intersectional innovation. But Edelstein himself also exemplifies the correspondence between quantity of ideas and successful innovation that is described in The Medici Effect; ten years ago he made other groundbreaking microchip improvements that made computers smaller and faster and he has registered 76 American patents. Judging from the vacuum microchip development it seems that it is natural for him look for solutions at intersections of fields and his achievements support the claim that this approach makes it easier to be innovative. I wrote a post about a month ago about a nature house for an alternative lifestyle that challenges our conceptions about the way homes are built. Here is another example of a creative living solution where the most interesting aspect is the unexpected combination. The research community in Sweden is experimenting with a new way of closing the gap between university research and companies. Unexpectedly the inspiration comes from popular talent TV show American Idol where potential pop stars get a chance to show themselves to producers and audience. At this intersection they use the simple concept of the TV show to expose advanced research to companies. The companies in their turn get a chance to find new ideas and future research stars. Just like in a show business talent hunt. The theme of the “competition” last week was biomarkers and a number of universities had nominated young promising researchers on their way to a PhD degree. Each researcher made a ten minute presentation of his/her project and then a panel discussion followed. The audience consisted of representatives from companies – potential buyers and financers. One more reflection from my stay in Budapest: The differences between Hungary and Sweden are fewer and less obvious every time I come back here and it is incredible how swift and dramatic change has been. One thing that remains, however, is that wages still relatively low. That means that labour-intensive systems are not a problem. Despite the fact that this is a high-tech country with access to the same tools and methods as Sweden they sometimes choose ways of doing things that are rather “old”. Quite simple solutions would improve procedures, save time and use less people. But since labour is so cheap there is not enough incentive for such innovation. Frans wrote a post a while ago where he showed how you can stimulate innovation by giving yourself limits; if you face a problem you will go around it and find a new method that makes the end result even better. It will be interesting to see what processes that will start in Hungary when labour costs become a limitation and they have to make use of the high level of education. Today many companies establish factories in Eastern Europe because it is cheaper. In the future the contribution of these countries to European economy will be much more dynamic than that. At the moment I am writing from Budapest, an amazing city that I have visited several times over the last fifteen years. For well known reasons there has not been much immigration to Hungary. Today that is slowly changing and I have found one thing that is interesting in the context of my two previous posts on the value of diversity connected to the international competition for talent. Hungarian universities have a very good reputation and they have realized that they can make money by attracting foreign students. Therefore they now have courses and programmes in English. For instance, you can now graduate from medical school in Budapest without speaking Hungarian and this is an interesting alternative to students from countries where it is extremely difficult to get accepted at medical school, like Sweden. This way they attract students that never would have considered Eastern Europe otherwise. (Sadly, many western Europeans are still very prejudiced about the new EU member states.) The Hungarian universities do this because it is good for their economy, but it also brings a mix of young scholars to a country that can definitely benefit from more diversity. So, this is another factor that makes people move within and to Europe. Hungary is not the only example and we will see more of it.